I have been writing letters to Death Row inmates for a while now. One man I was writing said that a revival occurred in Louisiana’s most notorious prison, Angola State Prison. I am also writing to a state penitentiary here in my home state of Kansas too. But in this state prison in Louisiana, what was once called Death Row is now being called Life Row. It is the eternal life and redemptive power of God’s forgiving grace. An unconditional pardon, if you will, for those who never hear from their own families anymore. But God is a God of second, third, and fourth chances. His forgiveness extends to anything that any human could ever do. The only sin that God will never forgive is not believing on Jesus Christ, His Son (John 3:17-18). Talk about a rewarding ministry. Listen to some of these prisoners who are either waiting on Death Row for a scheduled execution, or have had their sentences be restructured to life without parole. These are real people, with feelings and regrets, and real lives who will never, in this world, see the light of freedom again. But letters have changed their life for eternity. "This is to tell you of the joy your project brought to my life and time on death row. You gave my name to a lady named Jackie. She wrote to me, which became a very joyous friendship." tremendously and we - I - am glad you are there." nice to know that there are people who care." One man I was writing too, I never heard from again. I assume that he was executed. But since many of these men, and a few women too, have been saved, I will see them again some day. In heaven. I send them some of my articles about God, Jesus, and His free gift of eternal life and forgiveness. Remember that God gave us what we don’t deserve (called grace) and withheld from us what we rightly did deserve (called mercy), so why wouldn’t God forgive them? Your letters could make an everlasting difference. You can use a P.O. Box number like I do or General Delivery at your post office if you would feel safer, or perhaps even your churches address…but these inmates stand zero chance of ever getting out. God has forgiven them, even though society and their own families in many cases never have or ever will. It reminds me of the Lord’s Prayer: Father, forgive us our trespasses as we forgive those who trespass against us. God help us to cause revival, first in our own hearts, in our own churches, then our own communities, then our states, and then our nation. Extending to those even behind bars for life or sentenced to death. Matthew 25:36 says that when “I needed clothes and you clothed me, I was sick and you looked after me, I was in prison and you came to visit me.” Here’s your chance. You may also call 260-982-7480. Obviously capital punishment has less to do with justice and rehabilitation, grace and repentance and more to do with vengeance and usurping the place of God in the final judgment on a human being's life. If we truly believed in the redemptive power of suffering, and in God's grace and forgiveness, and the ability for any human to repent and turn around, and the possibility of an irreversible all too human mistake in the meting out of justice, we would have outlawed such barbaric legal practice a long time ago. 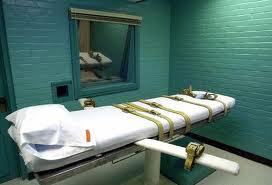 I am afraid that it is our justice system that stand condemned by the practice of capital punishment more than those who undergo it.